Don’t feed a cold: Research suggests that eating right, including foods rich in omega-3 fatty acids, can boost your immune system. (NAPSI)—The common cold is nothing to sneeze at. Americans in general suffer nearly a billion colds a year and, according to the Centers for Disease Control and Prevention, nearly 22 million school days are lost each year due to colds. • Include vitamin C: From citrus to broccoli, many fruits and vegetables offer high levels of this necessary nutrient. • Take a supplement: Multi-vitamins and probiotics can help you get more of what might be missing from your diet. • Stay hydrated: Drinking extra fluids—especially lots of water—helps prevent dehydration caused by cold symptoms. • Eat foods that are high in essential omega-3 fatty acids, such as chia seeds or ground flaxseeds. Sprinkle them on top of a salad or blend them into your favorite smoothie. 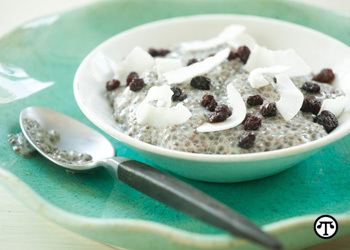 If you’ve never had chia, try this Chia Pudding recipe from Whole Foods Market. It can be a delicious way to introduce it to your diet. Put chia seeds, almondmilk and vanilla in a 1-quart glass jar with a lid. Tighten the lid and shake well to thoroughly combine. Or, stir together seeds, almondmilk and vanilla in a bowl. Refrigerate overnight. When ready to serve, stir well. Spoon into bowls and top with fruit and coconut. For further facts, tips and recipe ideas, visit www.WholeFoodsMarket.com.